My enthusiasm for the Large Hadron Collider is well known, so what could be better when an address by Professor Rolf-Dieter Heuer, Director-General at CERN, was scheduled as the Vice-Chancellor's distinguished lecture series at Birmingham University. We both enjoyed the talk very much. A video of a similar one can be seen on the YouTube link below. This is from a talk he gave at the University of Dublin. Tw tells me that Birmingham also recorded the event and I will link to that when it becomes available. Lots of Professor Heuer's, lecture resonated with me. What an achievement to be head of such a large organisation, with over 10,000 employees, mostly academics and engineers. This was two orders of magnitude greater than the number I managed when I was working, my 130 or so staff being a drop in the ocean by comparison. He said they were easy to manage as everyone was committed to a common cause. My experience, on a much smaller scale, was that faced with change, on the whole, the engineers would do as they were asked but would grumble, the academics would carry on doing what they had always done and would grumble. 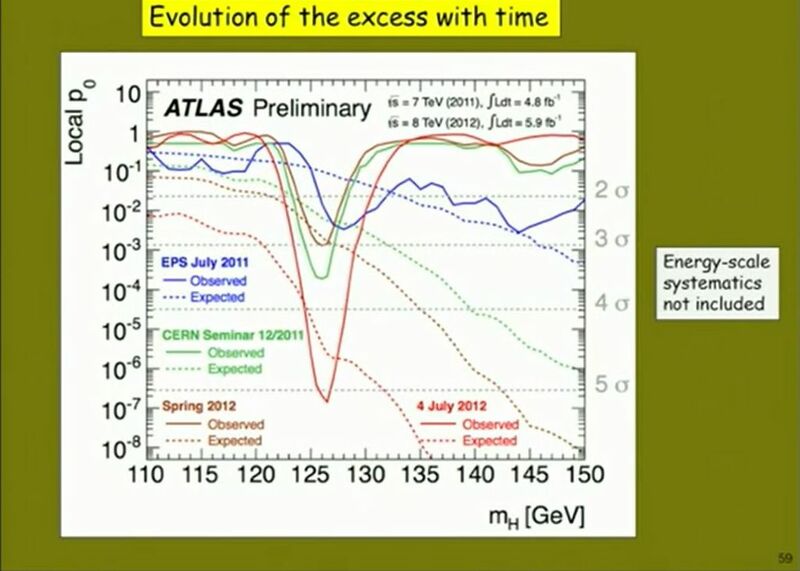 He also had to make the awesome decision as to when to close the LHC down for upgrades. He toughed it out and kept it running and discovering the Higg's was the reward. This is one of my favourite graphs, the integrated luminosity. It shows how much the effectiveness of the machine improved as it was optimised and people understood it better. 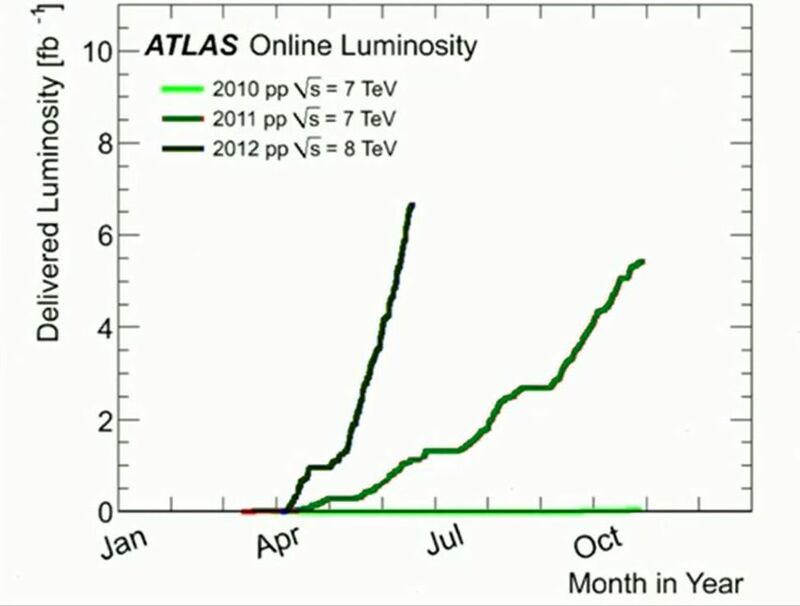 The last few months of operation saw the most delivered luminosity, just the extra quantity of data needed to confirm the Higg's. The following series of plots show how the significance of confirming the Higg's changed as more data came in. Typical of a statistical process, the accuracy of the prediction fluctuates widely until the data set gets big enough. I remember that second data set and how despondent people were that the results were not converging as they wanted. Some of us were even hoping for 'new physics', but look at that last 5 sigma plot! I enjoyed this immensely, both its preparation and its presentation. This is tw's abstract taken from the Newsletter of the Institute of Physics. January 2010 Tuesday 23 February, 7.30 p.m.
Positron imaging: from medical uses to industrial applications Dr Thomas Leadbeater, University of Birmingham. An everyday application of nuclear physics is the production of the remarkable images used for medical diagnosis, where the distribution of a radioactive material is accurately determined throughout a person's body. But did you know that this type of imaging is also used to study industrial processes as far ranging as food processing, pharmaceutical production and plastics refining, to name but a few applications? 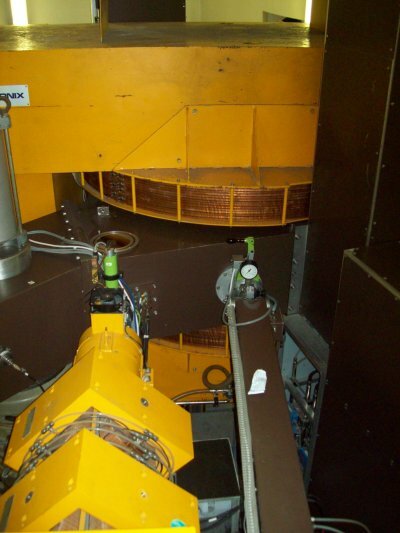 This talk will present an overview of the positron-imaging techniques used in the medical discipline of Positron Emission Tomography, and a technique for studying granular materials called Positron Emission Particle Tracking. A discussion of some of the basic nuclear physics behind radioactive isotope production (using a cyclotron), antimatter annihilation and radiation detection will also be given in the context of radioisotope imaging. Please note that tea and coffee will be provided from 7.00 p.m. in the tea room of the Poynting building. The lecture programme can be found online at Lecture programme Up-to-date details and maps of the university can be found on the university website at University location. We went to The Plough where their monday evening special was buy one get one free pizzas. This of course meant buying four pizzas between the three of us and ordering them in the correct sequence to get the best discounted rate, as it was the cheaper option that was free. We then set off in search of real beer and moved on to The White Horse. The barmaid commenting, pointedly, that she had overtaken us earlier and I gather had not been impressed by our wobbly progress on the streets of Birmingham. Still the beer and pub were good, definitely an improvement on the Bear and Billet, our usual last pint haunt. The ride back was not without its moments though, as we missed the turn across the park and then continued up the wrong side of a dual carriageway road. Me keeping determinedly to the left hand-side and wondering why I was getting strange looks from drivers who would otherwise have been in the fast lane. This was a small hazard compared with what was to come though, as eventually we head off across the park, which was not exactly lit. Very pleased with myself that I was able to negotiate the concrete bollard in the middle of the road before the bridge. And then somewhat non-plussed when I came across its twin, albeit missing its top half and so practically invisible, at the other end of the bridge. 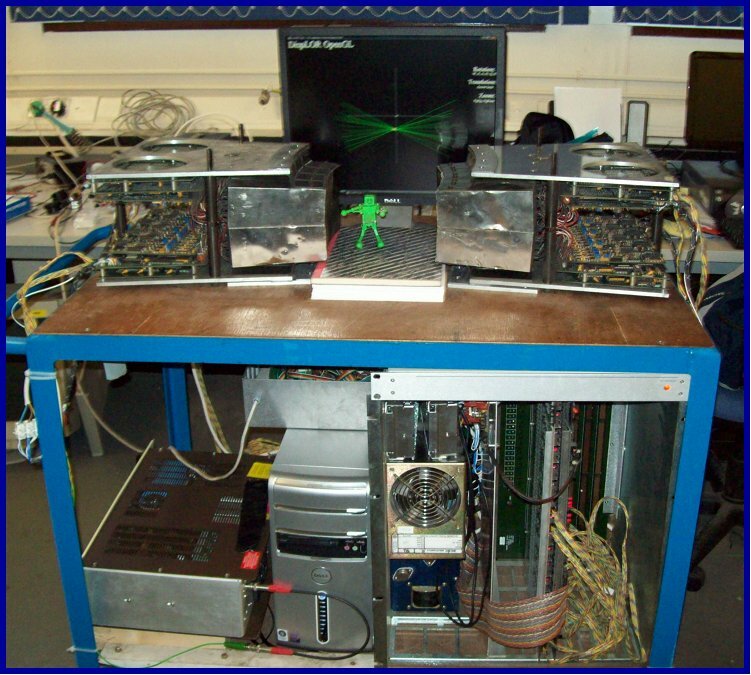 I had the best seat in the house to see the whole process involved in doing a PEPT experiment. 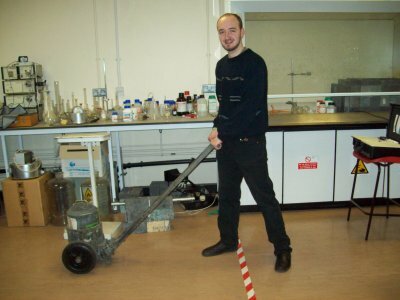 It was not long before we got the message that 'the water' was ready, so off we trooped to the radio-nuclides lab. 'The water' had spent some time earlier that day being irradiated by 33MeV Helium-3 nuclei from the cylotron. This changed some of its oxygen atoms to flourine 18 atoms. The point of all this is that the F18 is unstable and decays by emitting the anti-particle to the electron: a positron. (and of course a neutrino but they are weakly interacting so we don't care about them) What is useful about this is that when the positron meets a normal matter electron they annihilate into two characteristic gamma ray photons. Conveniently these two are emitted in opposite directions. Well we usually say things like 'in the reference frame of the electron-positron pair' and 'subject to Compton scattering' and nod our heads sagely but the whole point is that if we can detect the photon that went in one direction and the other in the opposite direction and draw a line between where we detected them, then we know they originated at a point somewhere on that line. If we can get a few more, from different directions, we can locate the position of the source by triangulation. Finding them is quite a good trick though and this is done by using an array of detectors, surrounding the experimental area. When an event is detected in one detector, all the others are looked at as well for a very short time. If one responds in time we assume that it is the other half of the decay process and we know that the particle must be somewhere on a line drawn between the two detectors. This is the coincidence detector. Then by using a bit of clever programming by tw, the lines can be displayed on the screen and the position of the particle determined. Heaven's gate, the thick, radiation proof doorway. As the cyclotron was not running, this meant we could have a good mosey around inside and have a look at the works. I've always had a bit of a soft spot for particle accelerators and cyclotrons in particular so this was a lot of fun for me. 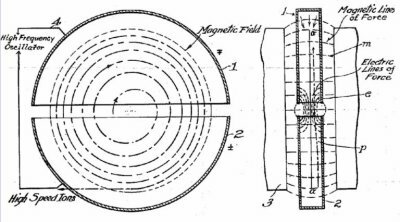 What I like about the cyclotron is that it uses electric and magnetic fields to do its work. In a simple cyclotron, source partices, in this case helium-3 ions (although they can also do protons, alphas, deuterons, light positive charged ions), are injected in the middle of a disc shaped electrode which is split across the middle so it looks like two capital Ds back to back. The Ds have a high voltage between them and this accelerates the ions across the gap between them. The magnetic field puts a radial force on the ions and this makes them move in a curve. Get this just right and the ions go round a tight little circle in the middle. Every time they cross the back of the Ds they get accelerated a bit more and as they move faster and faster, they don't get bent quite so much and actually move in a spiral. When the diameter of the spiral approaches the diameter of the Ds the ions are allowed to escape and run into the experimental beam tubes. The Birmingham cyclotron is a little more complicated as each D is split in two and so the ions are accelerated 4 times on their journey round the disc. 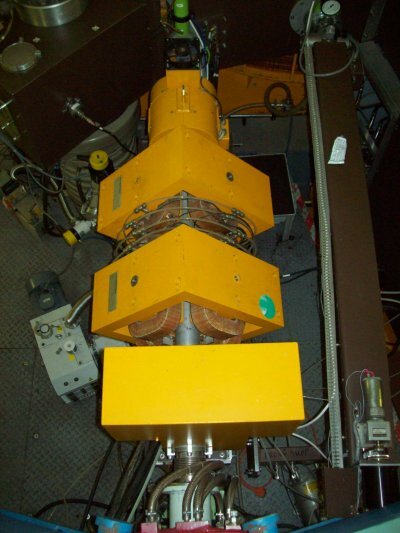 It also has a beam splitter to share out the beam between experimenters. 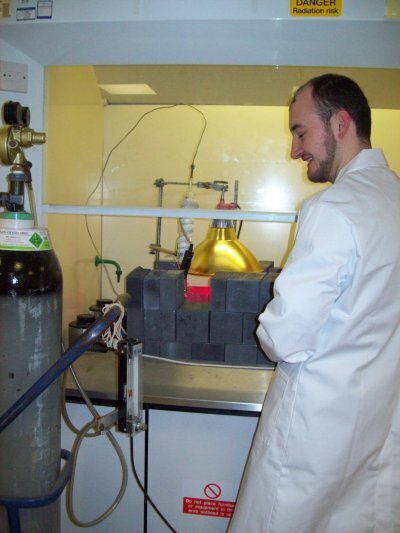 Once the water has been irradiated, the chemists get to work on it and add small granules of an ion exchange resin, as used in dish washers and water softeners, and exchange some oxygen for the flourine. So when they told us that the water was ready, they were lying as it was a lot more complicated than just that! Radio active materials are handled with care and kept in radiation proof containers when possible. 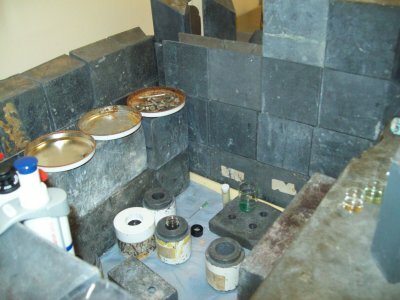 These can be constructed out of lead blocks. Radiation workers are subject to government regulations which prescribe how much radiation they can be exposed to and to make sure that these levels are not exceeded, they must measure their exposure whenever they handle radio-active material. This is done with the dosimeter, attached to tw's head and also others inserted in his gloves and lab coat pockets. He doesn't have to wear these when he has dental x-rays which is just as well as these can be a bigger source of exposure to radiation than the work he is doing. Wearing the proper Personal Protective Equipment [PPE] he is ready to start making the tracer sources. The granules are very small so they have to be manipulated under a microscope. Several are selected as they all have varying amounts of activity. Knowing their half-life [Fluorine-18 t1/2 is ~110 min], a quick estimate can be made to ensure that they will have the right activity to perform for their audience 9 hours later. [~5 half-lives later] Typical activities for experimental runs in the Centre are between 500uCi - 2mCi, we needed about 70uCi for the lecture so needed to start off with an activity of about around 2240uCi [2.24mC] to have 70uCi left 5 half-lives later. Next the water they are floating about in is evaporated by heating with an infra red lamp while nitrogen gas is blown over the surface. This leaves the particle of resin as the tracer source. 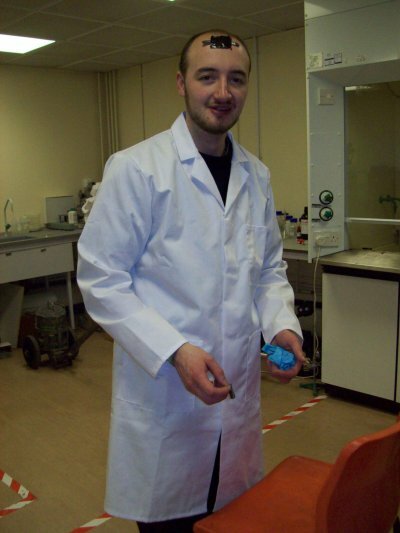 As a little light relief, Iain had promised us a ride in one of the University's hydrogen fuel cell powered cars and we were conducted on a drive-about around the campus. 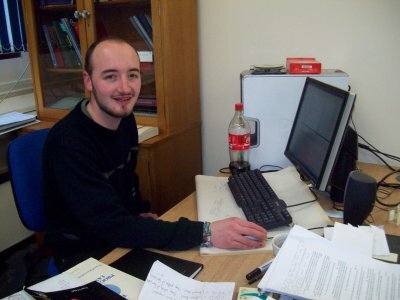 Iain's PhD research has been about using fuel cells for domestic combined heat and power generation. This would use waste heat generated elswhere in the home to generate electricity. Use this link to see an abstract of his work. Despite the demonstration, I was not convinced that I should make a quick switch to a greener alternative to petrol, even if hydrogen is now available at a number of service stations, albeit that their distance apart is only a few miles greater than the distance the car can go on a full tank. 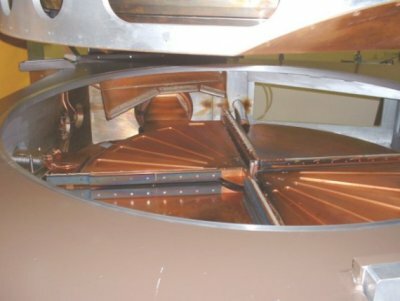 In the photograph, tw holds the source between the two banks of detectors and the caculated position of the source can be seen on the monitor behind the detectors. 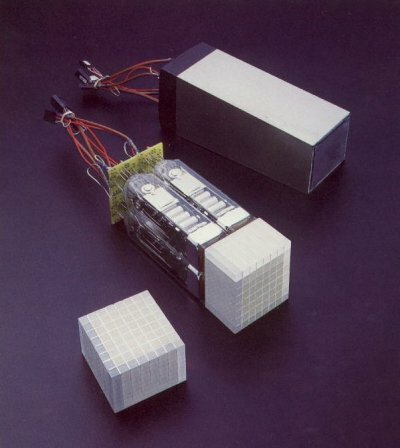 Each bank of detectors is made up of two blocks of four stacked on top of each other and each of these is further divided into 64 segments each. This gives 64X4x2=512 detector elements on each side. The modular camera has been constructed by removing the detectors and associated electronics and power supplies from their original location in a body scanner. They have then been re-assembled into a new configuration with new electronics to interface them to a PC with new software to record and interpret the data. 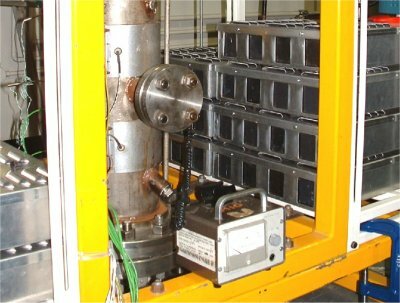 As the detector units have been re-constructed into portable blocks, they can easily be built up around any system of interest wherever it is located. And here he is in a short video strutting his stuff in front of the camera. The graphic behind shows how the source is moving. As Louise says, 'the world's most expensive sparkler' though I suspect our friends at CERN have done better, or was theirs a banger? We rattled the demonstration model across the potholes to the lecture theatre and then had to wait 30 minutes or so for a lecture in the room to finish. This gave us ample time to peruse the collection of historic physics apparatus on display and work out what the various bits were was used for. Tw commenting that the kit he was using is already 20 years old so almost half way there to being of historical interest. Nearly 100 people attended the lecture and there were some good questions and a lot of interest afterwards. As the modular camera depends on physics, chemistry, 3-D geometry, electronics, and computer programming, someone wanted to know which of the various bits were tw's expertise and responsiblity. 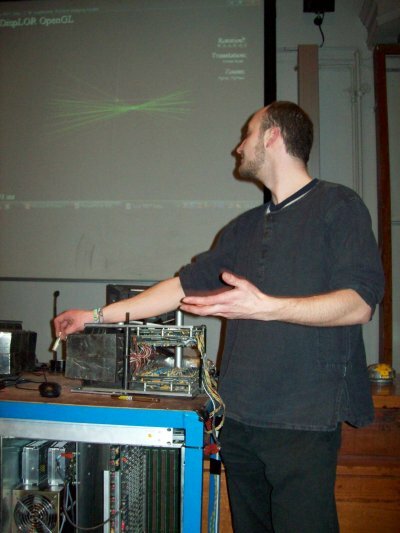 He made quite a bit about not being involved in the chemistry, and rather played down his happy hours with a soldering iron and long nights with C compiler and vector graphics. It was good to see several sixth formers from local schools in the audience and to experience their enthusiasm for what they had seen. Tw is especially keen to find more applications for this technique, so if you want to know more about something that is hidden from view, contact him at twl@np.ph.bham.ac.uk. If your problem is that you are not sure if the light goes off in your refrigerator when the door is closed, go to rent-a-midget for some small helpers. Tw tells me that he is quite happy to present this lecture, or one like it, to schools, science groups etc. I think that PEPT is likely to be the next BIG thing so book him now for your wedding or Bar Mitzvah before it is too late. Contact tw by email at twl@np.ph.bham.ac.uk, or through the Positron Emission Tomography Group at Birmingham University. The Nuclear Physics Group at Birmingham University. 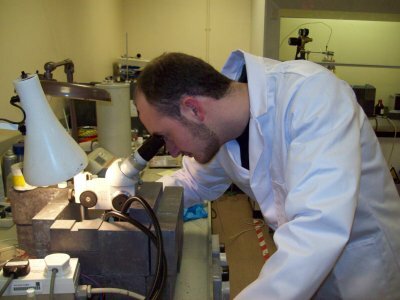 Details of research and post-graduate studentships. Positron Emission Tomography Group at Birmingham University. 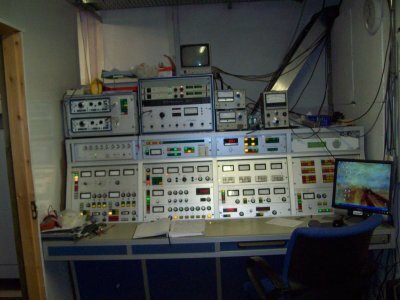 Positron Emission Particle Tracking in Cape Town. Once the questions and conversations were over and the camera safely returned to the lab, we were ready for a beer at the OVT followed by curry at the Sudarbon restaurant. I have not been able to find a decent link to this place but it is a favourite with us when we are in Selly Oak, though we do spread our custom elsewhere as well. What is good about them is that they usually have curried game on the menu, pheasant, duck, venison etc. Now I don't really expect that this prior notice will actually result in anyone extra going to this but its posted here for all that! Details can be found here Sci Bar on Facebook. This month, the talk will be on Science and Beer! The family-run local brewery The Shotover Brewing Company will be talking us through the process of beer making. There will also be beer-themed experiments so we can pick up some party tricks while discovering the science behind the brew! Thursday March 18th, 6:30 pm, upstairs at the Cape of Good Hope. To-night [19 February 2010] I went to the Oxford Sci Bar meeting of the British Science Association, as usual, this was an interesting evening. We are all genetically different from one another, apart from identical twins. These differences determine much of our outward appearance and inner chemical make up, from facial features and taste preferences to disease susceptibilities and response to drugs.They can also tell us about where we come from and who were our ancestors. It would indeed be a dull world if we were all the same. 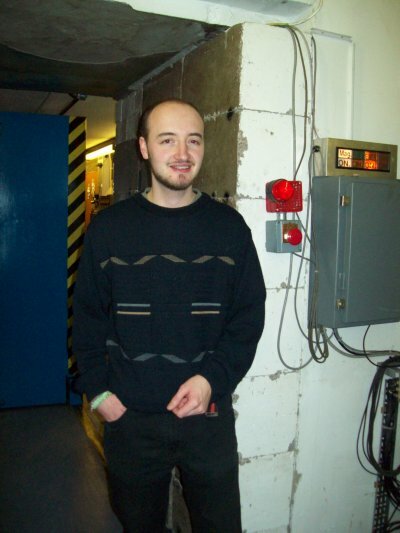 He described the project he is running which is to develop a genetic map of the People of the British Isles. The research is funded by The Wellcome Trust. 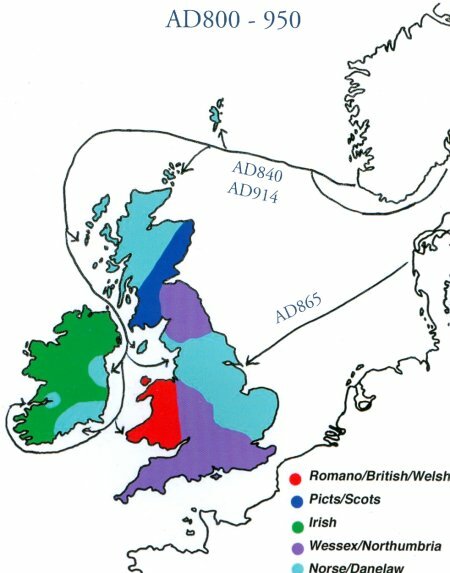 Preliminary results were most interesting, showing how waves of immigration and conquest from the first millenium have left their mark on the genetic makeup of people living in different regions of Britain 1000 years later, to-day. We repaired to the bar after the talk and I glanced out of the window and saw that the rain had turned to snow. It was the sort of low temperature snow that I love, the flakes are as big as plates and it takes about four of them to block the road. 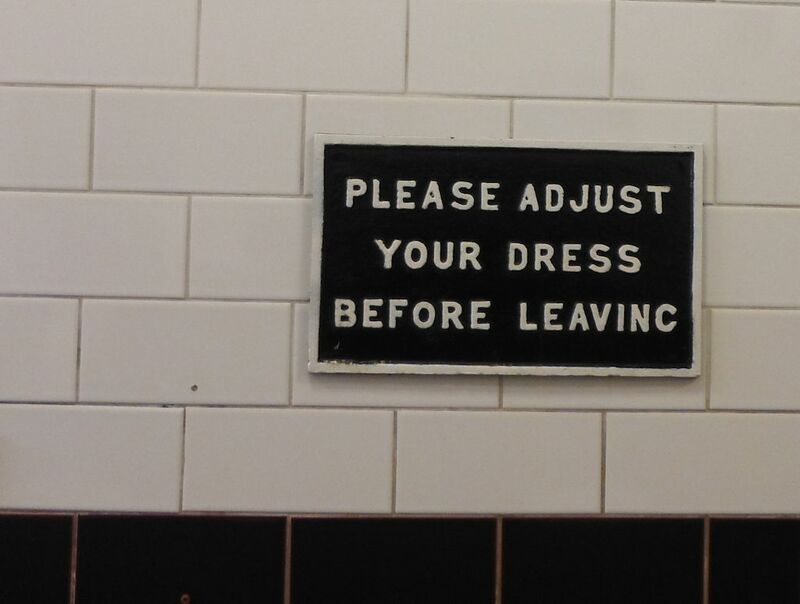 Hmmm and I had to drive home. Well it wasn't too hairy a drive, but that it was difficult to see, as the light from my headlights reflected from the snow flakes was very bright. It was even worse when I switched to high beam. This got me pondering Olber's paradox as the snow flakes seemed to be quite a good model for a uniformly distributed star field, albeit that its brightness was from the light reflected from my headlights and not intrinsic to the stars. Certainly, the impression was that the night sky, as modelled by my view through the windscreen, was windscreen, was not dark. Olber's paradox is that the sky at night should appear to be as light as day, assuming that the distribution of stars through space is uniform. The fact that the sky IS dark is a consequence of the non-uniform distribution of stars caused by the expansion of the universe. It was also a good representation of the solution to the classic Physics 101 problem of determining how much rain [in this case snow] 'falls' on a vertical plane [window] moving through field of vertically falling raindrops. 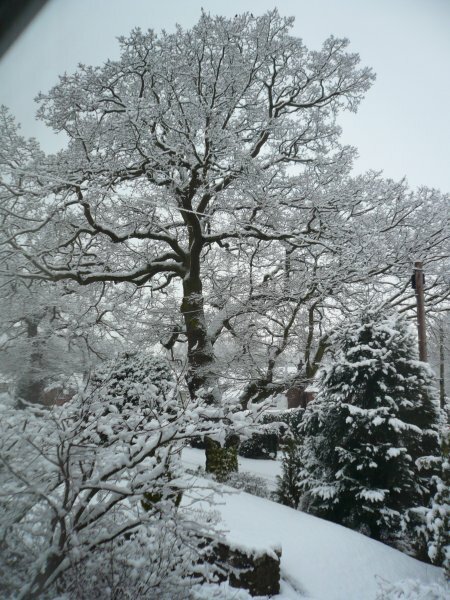 At the top of my field of view, and distant, the snowflakes appeared to be falling vertically but as the car approached their trajectories appeared to change to horizontal as they hit the windscreen. Tw and I used to find this just wonderfully amusing and still make up new and certain proofs for the impossible. Lemma 1. All horses are the same colour (by induction). Proof. It is obvious that one horse is the same colour. Let us assume the proposition P(k) that k horses are the same colour and use this to imply that k+1 horses are the same colour. Given the set of k+1 horses, we remove one horse; then the remaining k horses are the same colour, by hypothesis. We remove another horse and replace the first; the k horses, by hypothesis, are again the same colour. We repeat this until by exhaustion the k+1 sets of k horses have been shown to be the same colour. It follows that since every horse is the same colour as every other horse, P(k) entails P(k+1). But since we have shown P(1)to be true, P is true for all succeeding values of k, that is, all horses are the same colour. Proof. Horses have an even number of legs. Behind they have two legs and in front they have fore legs. This makes six legs, which is certainly an odd number of legs for a horse. But the only number that is both odd and even is infinity. Therefore horses have an infinite number of legs. Now to show that this is general, suppose that somewhere there is a horse with a finite number of legs. But that is a horse of another colour, and by the lemma that does not exist. Proof. If a sentential formula in x is logically true, then any particular substitution instance of it is a true sentence. In particular then: 'for all x, if x is an elephant, then x is the same colour' is true. Now it is manifestly axiomatic that white elephants exist (for proof by blatant assertion consult Mark Twain 'The Stolen White Elephant'). Therefore all elephants are white. By corollary 1 everything is white. Theorem 2. Alexander the Great did not exist and he had an infinite number of limbs. Proof. We prove this theorem in two parts. First we note the obvious fact that historians always tell the truth (for historians always take a stand, and therefore they cannot lie). Hence we have the historically true sentence, 'If Alexander the Great existed, then he rode a black horse Bucephalus.' But we know by corollary 2 everything is white; hence Alexander could not have ridden a black horse. Since the consequent of the conditional is false, in order for the whole statement to be true the antecedent must be false. Hence Alexander the Great did not exist. We have also the historically true statement that Alexander was warned by an oracle that he would meet death if he crossed a certain river. He had two legs; and 'forewarned is four-armed.' This gives him six limbs, an even number, which is certainly an odd number of limbs for a man. Now the only number which is even and odd is infinity; hence Alexander had an infinite number of limbs. We have thus proved that Alexander the Great did not exist and that he had an infinite number of limbs. Fuel cells for domestic combined heat and power: are they worth it? Fuel cells could substantially decarbonise domestic energy production, but at what cost? It is known that these micro-CHP systems are expensive but actual price data has been elusive. Economic realities constrain individuals' decisions to purchase and national policies on climate change, so this lack of understanding has delayed commercialisation and government support. Models were therefore developed to simulate the economic and environmental benefits from operating fuel cell micro-CHP systems in UK homes, and to project current purchase prices into the near future. These models were supplied with economic and performance data from an extensive metareview of academic and commercial demonstrations; showing for example that fuel cell efficiencies are a third lower when operated in people's homes rather than in the laboratory. These data inputs were combined with energy consumption data from 259 houses to give a broad definition of operating conditions in the UK. The techno-economic fuel cell simulation model was validated against results from literature and Japanese field trials, and then used to estimate the changes in home energy consumption from operating the four leading fuel cell technologies in the UK. 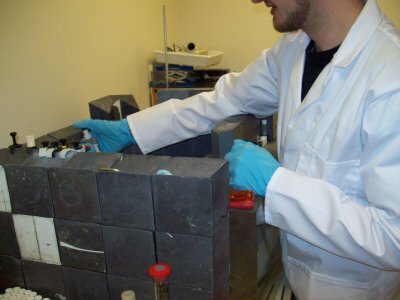 Fuel cells are shown to offer negligible financial benefits in the UK at present. Energy bills would increase in 30-60% of homes, due in part to the low value of exported electricity. Savings are higher in houses with larger energy bills, but significant variation between similar properties confirms that simple trends cannot be used to identify ideal houses for fuel cell micro-CHP. The feed-in tariff proposed by the UK government would radically improve economic outcomes; as 10p paid per kWh of electricity generation would reward fuel cell owners with £600-750 annually. It is estimated that today's fuel cells produce 360-450g of CO2 per kWh of electricity generated due to reforming natural gas into hydrogen on-site. Their carbon intensity is therefore 30-45% lower than the UK grid, enabling average annual emissions reductions of 1-2.2 tonnes per home. These reductions depend strongly on the displaced electricity generation method, and could therefore range from around zero when displacing high efficiency gas turbines up to 5.5 tonnes if displacing coal. From learning-by-doing, the price of Japanese 1kW PEMFC systems is shown to have fallen by 19.1-21.4% for each doubling of production volume. Prices are therefore projected to fall from £15,000 today to £6,000 within 10±5 years, determined primarily by the speed and scale of deployment world-wide. A commercially viable price of around £3,000 is however expected to be two decades away, and widely held targets of under £1,000 per kW are argued to be unobtainable with current technologies due to the requirement for extensive balance of plant and auxiliary systems. Combining all these findings, the payback period of PEMFC systems would be 25-45 years with the proposed 10p/kWh feed-in tariff. This could fall to within current system lifetimes after 5 to 10 years of cost reductions; however, without this level of government support the savings from operation will be unable to give payback without major improvements in technology performance or more favourable energy prices. The carbon cost of current PEMFC systems is estimated at £750-950 per tonne of CO2 mitigated. This figure is highly sensitive to the carbon intensity of displaced generation, and would reduce to £175/T if generation from coal plants is avoided. Fuel cells are therefore not among the 'low hanging fruit' of carbon abatement technologies, although the carbon costs will halve over the next ten years in line with system price reductions. Investment in this technology must therefore be considered a long term strategy for low-carbon energy production. 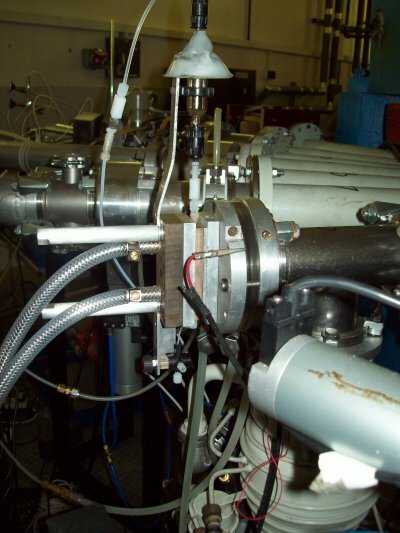 The diagnostic medical imaging technique of Positron Emission Tomography (PET) has been adapted at the University of Birmingham for use in imaging industrial processes. 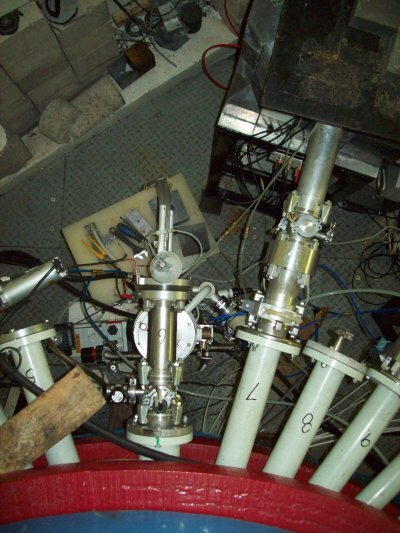 A particularly powerful technique, called Positron Emission Particle Tracking (PEPT) is used to study granular materials and fluid flows in a number of different applications. The PEPT technique is used to follow the motion of a single particle labelled with a positron emitting radioactive isotope. The decay of the isotope and subsequent annihilation of the positron results in two back-to-back gamma rays, the detection of which defines a line along which the tracer particle is located. Triangulation of a number of successive events allows the particle to be accurately located in three dimensions on a short timescale. 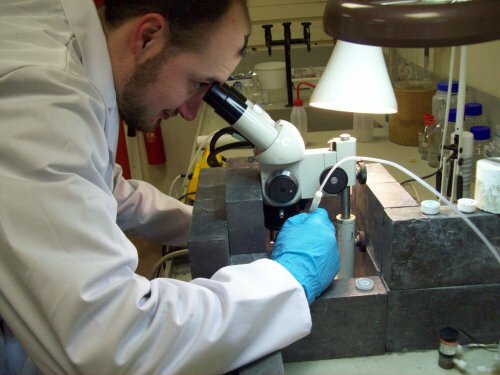 The dynamic behaviour of the material can be studied in detail using this method. This thesis describes the most recent development of the detector systems which are used for PEPT studies at the Positron Imaging Centre. 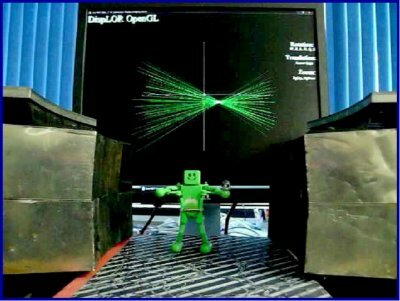 Primarily the work has focussed upon developing a modular positron camera which can be arranged in custom geometries around the system under study. 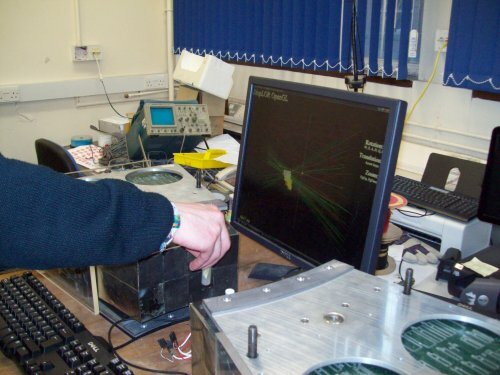 This camera is transportable and has been used to study a number of applications in situ, opening a wide range of potential applications which had previously proved impossible to study using the PEPT technique. 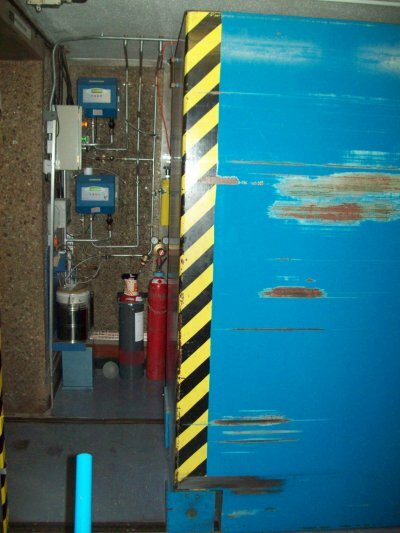 The detector systems are derived from clinical imaging systems and have thus required significant modifications to allow their use for the study of industrial systems; these modifications are discussed in detail here. One of the major limiting factors has been the original data acquisition system provided with the camera systems. This was designed to produce medical images over a long timescale and has proved unsuitable for the high speed storage of information with the time resolution required for a dynamic PEPT study. A new data acquisition system has therefore been designed to better enable the storage and analysis of the raw data produced by the detectors. 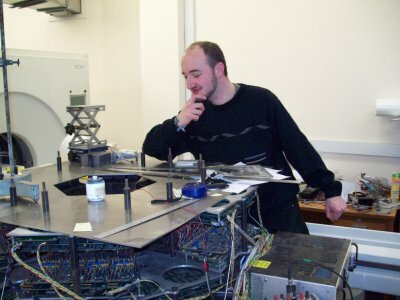 This device is based around a single desktop computer: it has significantly reduced the complexity of the original system and offers much in the way of flexibility for data acquisition and analysis. The system has proven to operate reliably and with superior performance compared to that of the original device, for example the data storage rate has been greatly increased, allowing for more frequent and accurate PEPT locations to be made. The modular camera and the new data acquisition system are supported by a software suite allowing for PEPT analysis and the display of both raw and PEPT location data. Real time analysis and real time display of the tracer location is made possible with this software which is described here. 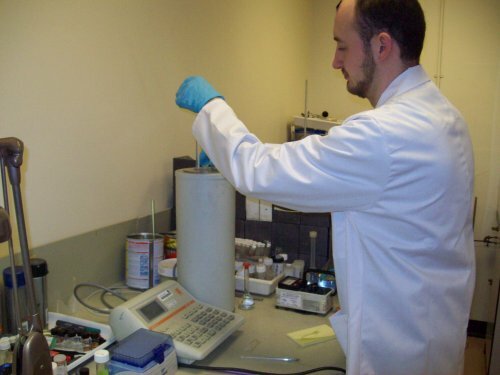 The modified devices have been used for a number of PEPT studies on different systems in various locations. Results and brief discussion are given here to illustrate the power of the techniques and of the new systems for deriving relevant data regarding the processes studied. 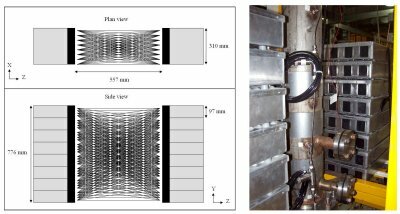 Applications include improving process efficiency and gaining understanding of the flow dynamics within industrial applications such as fluidised beds and polymer extrusion plant. To find out if the light goes off in your refrigerator when the door is closed, hire two midgets from Rent-a-Midget, specify that you want one that always tells the truth and another that always lies. Unfortunately, you will find that they will not be labelled as to which is which. Wrap them up well in warm clothing, put them in your refrigerator and ask them to observe what happens to the light when you close the door. Rent-a-midget regulations stipulate that you may only ask one question of one midget when you re-open the door. What question should you ask to ensure that you get the true status of the light? What method of proof will you use?